A recent article in the Albany Business Review brought to my attention an important program available through National Grid, the core business of transmission and distribution of electricity and natural gas to customers in New York, New Hampshire, Massachusetts and Rhode Island. The Small Business Program was designed for business customers with an average demand use of 200 kilowatts or less (or 40,300 kilowatt-hours or less) per month, National Grid can help you reduce your company's energy costs by installing energy efficient equipment. •National Grid will pay 70% of the cost of the installation of energy efficient equipment and you can finance the remaining 30% interest free for up to 24 months. Long Island Power Authority's Commercial Construction Program was created with the needs of Long Island businesses such as yours in mind. Lower operating costs and increased efficiency offer savings, a key component to success on Long Island. LIPA’s incentives help to lower the cost of purchasing energy-efficient measures. There are three paths in the Commercial Efficiency program; each one designed to fit the needs of a particular customer. •Prescriptive Approach - Offers incentives for choosing equipment from a pre-qualified list of energy-efficient measures. •Custom Approach - Provides technical assistance, incentives and the flexibility to choose unique measures not on the Prescriptive list. •Whole Building Design Approach - A comprehensive approach in which you, your building design team and LIPA-supported experts work together, from concept to completion, to develop an energy efficiency plan specially designed for your entire building. •Not-For-Profit Organizations - In addition to the offerings listed above, there are additional incentives for qualifying Not-for-Profits. Wherever you are in New York State, make sure you contact your local power provider regarding these incredible financial incentives for creating a more energy-efficient business. Research includes sales by state and region of Nordic, Alpine and Snowboarding equipment. Transworld Business: "The leader in boardsports news and information" will keep you up-to-date in snowboarding equipment trends and the hottest cold-weather companies. National Ski Areas Association: Industry statistics include participation figures, number of ski areas by state, and helmet usage data. Earlier this month, denizens of the blogosphere descended on Las Vegas for three days of networking and socializing at the 2009 BlogWorld & New Media Expo. Besides the conference and trade show, there was much to learn from the keynote speakers, and of particular interest was the 2009 State of the Blogosphere delivered by Technorati CEO Richard Jalichandra. Introduction: Why the results of the survey are displayed according to four different types of bloggers. Day 1: Who Are the Bloggers? We delve into the demographics. Day 2: The What and Why of Blogging: Why we do what we do. Day 3: The How of Blogging: How often we blog, what technologies we use, and whether or not we track our traffic. Day 4: Blogging Revenues, Brands and Blogs: Branding and monetizing our blogs. Day 5: 2009 Trends: Political Impact of Blogging, Twitter Usage. Since 2004, Technorati's annual State of the Blogosphere report has followed growth and trends in the blogosphere. For the second time, bloggers, generous with their thoughts and insights, were surveyed directly to provide the data for the report. The 2009 State of the Blogosphere survey demonstrates that the growth of the blogosphere's influence on subjects ranging from business to politics to the way information travels through communities continues to flourish. In a year when revolutions and elections were organized by blogs, bloggers are blogging more than ever, and the State of the Blogosphere is strong. It's Too Early . . . or is It? Yesterday, the 12-year-old in my house reminded me that it was just two months until Christmas. It dawned on me that I'd not yet heard a single holiday song in a store, nor have I seen aisles of pharmacies or supermarkets turned over entirely to that season. I thought this to be a big change from recent years, when I began to think that the Halloween season had been absorbed in to Christmas, much like how small towns in the country wake up one morning to find out that they've become a suburb to a big city. Coincidentally, I would up reading this press release heralding the 2009 Online Buyer Economic Trends Study from Performics. This firm conducts consumer surveys every six months regarding their attitudes towards spending. This survey focused specifically on holiday shopping. - Friends, co-workers, and extended family are likely not to receive gifts like they had in the past. There's a lot more in the report. Information on obtaining a copy can be found in this press release. It's free of charge, and would make a nice gift for your coworkers. In today's fast-paced world, eating out at restaurants has become a normal aspect of life, with convenience a main factor in choosing where to eat. According to Dun & Bradstreet's Million Dollar Total, there are over 30,000 eating places in New York State. With so many restaurants, is it a feasible option to choose a restaurant as the business that you want to start? In one word, yes. If you can fill a need or create a new and exciting option for locals to eat at, a restaurant can be a very viable business idea. Below are resources to help you start your restaurant. I think the trouble with a lot of marketing ideas is that they fall outside our comfort zone. I imagine that a lot of small business owners are good at making lasagna or tables or cleaning yards but the marketing of the business is where they are not comfortable. Especially when the business is home-based, the "business" doesn't feel that different from the individual. When we send a bunch of great marketing ideas on to the client, I wonder what proportion are useful in that they feel capable of executing them. What I notice in my daily travels are businesses who seem not have taken very simple steps to promoting their businesses. My biggest peave are shop windows that look so dark and uninviting that business appears closed. Lighting a window, improving a sign, finding a niche and capitalizing on it seem like steps even the shyest business owner can implement. While some suggestions sound modest and not necessarily worthy of a literature search, proposing that owners carry business cards, and make specific requests to current clients to circulate cards to colleagues or a reciprocal referral relationship with other businesses may be small steps to reach out a little every day to new customers. I'm pretty sure I've blogged about specific articles from Mashable - The Social Media Guide, but if you have any questions about social media and how to use it, this site has a lot of helpful information. Today I discovered their neat-o "How-To" section. Topics are diverse and include "How to Integrate Facebook with Your Blog," "How to Get Started With Google Wave" "How To Customize Your YouTube Channel," and even "How to Plan a Wedding on the Web" (I'll be reading that one on my own time). There are lots of comments and suggestions from other readers, so one way or another, you're likely to learn something pretty practical. 411SmallBusinessFacts.com is a searchable data base of approximately 2,000 facts about American small businesses and their owners (or managers) produced by the NFIB Research Foundation. The Foundation developed this information from telephone surveys of small employers – those employing from one person in addition to the owner(s) to 250. Data collection began in 2001 and continues through the present. The data are gathered regularly for a series of publications known as NFIB’s National Small Business Poll. New Poll data are added to 411SmallBusinessFacts.com eight times annually. The small business facts presented in the data base address a wide range of subject matter and include material which typically cannot be found in other sources. You can do a quick search, but it's easier to search by keyword, category, or poll. If you're looking for a centralized location to access government forms, try Forms.gov. Forms.gov provides access to a catalog of business and citizen federal forms needed to interact with the Federal Government. Forms for both voluntary and regulatory interaction with the Federal Government are included. Forms.gov includes over 5,400 forms, with new and updated forms being added daily. Users can search for forms by agency, form name, form number, or keyword. If you don't find the form you need, try visiting the applicable agency's form page (links provided at http://www.forms.gov/bgfPortal/nav.do?oa=agencyForms). So I did. I think it's most useful when people have no idea what bureaucracy they should be dealing with. Still, I discovered that Schedule C is a form not only of the IRS but of FAR as well. BTW, W2 generated no response, but W 2 got me information about W-2 IRS forms. An article titled "Perform Due Diligence on Potential Investors" appeared recently on Business Week's website. Its author (Tom Taulli) reminds those pursuing venture capital and/or angel financing that, despite current lending conditions, there's still an obligation to review the qualifications and histories of potential investors. Just because traditional lending sources have tightened is no reason to act desperate, and give away too much during negotiations. Both sites are useful in that they enable those seeking investment to comment, critique, and/or condemn the performance of some funds out there. A little background, then, can only help. Geri Kavanah, Jerry Kobre and Tom Morley of the Rockland SBDC (and Tee Rowe, the new CEO at ASBDC) are all featured in this USA Today piece. Our beloved State Director, Jim King highlights the importance of being a hands-on owner, and staying familiar with many aspects of business operation for CNNMoney.com. Lucille Wesnofske, Director of the Farmingdale Small Business Development Center discusses the efforts of small business owners to hold on to their staff during difficult economic periods (also at CNNMoney.com). So much of effective marketing is just good timing. I think it is the difference between the waitress coming over while you are mid-bite to ask how satisfied you are with your meal and receiving a call or a reminder card at just the time you would need the nudge. I called a pest control service in the summer and they came and did their thing. Last week, I received a call asking if there was anything else they could do for the fall or winter service. I hesitated over a wasp's nest but that call made the difference. Unlike the politicians who inundate their audience with so many posters and sorry-we-missed-you cards that you can't stand the sight of them, an infrequent but well-timed mailing can be very effective. 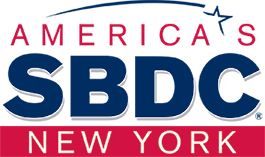 The NYS SBDC Central office has been getting an inordinate number of pre-recorded phone calls lately. Many of them are apparently random-number generated and have messages that start: "We're pleased to let you know that you are eligible for our debt reduction service..." Quoting Simon & Garfunkel: "And blah, blah, blah." Since someone has recently asked us about how to build their credit, here are some do's and don'ts. DO establish credit by getting at least one credit card. DO choose a credit card wisely. DON'T, if you do get into credit difficulty, hide the overdue bills in a drawer, but rather talk with your creditors. DO get your credit report. You can get it for free. DO dispute credit report errors - yes, they do make mistakes, especially if your name is common. 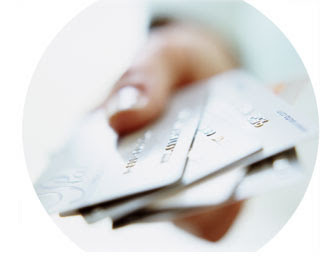 DON'T believe claims such as "We can erase your bad credit — 100% guaranteed". DON'T try to hide unfavorable credit information by establishing a new credit identity, unless you are a big fan of hefty fines and prison terms. There are lots of companies who will offer to sell you ways to get business credit; some of them will be telling you, or doing for you, some of these same steps. A couple recommended free guidelines from About.com can be found here and here. Last month, the Economic Research Service (part of the US Department of Agriculture) released a 33-page report titled "Marketing U.S. Organic Foods". It spells out the continued growth in demand in the U.S. for organically-grown products. It identifies which distribution channels have proven the most successful for farmers to pursue, but also notes that supply sometimes cannot keep up with demand. An interesting read for our organically-minded clients. The research network at the NYSSBDC has updated a document that can be used as a guide and information source for our clients in today's rough economy. Originally created in July 2008, this is the fifth version of the paper. The guide combines facts and figures regarding the current state of the economy as well as tips and strategies for surviving in down times. In order to create the document, we visited major and business news websites and found the most recent articles and blogs that are applicable to our client base. We would be happy to send the document to any advisor or NYSSBDC employee who requests a copy. Feel free to call, email, or leave a comment and we will send you what we are calling the "white paper". The other day, it smelled really bad on the third floor of 22 Corporate Woods. Sewer maybe? It would have been really nice to open a window, but that's not an option. However, if you worked from home, you could open a window, and in the process improve your home office feng shui. Learn more about how color, desk placement, and sounds can improve the good energy flow of your workspace. I was on Internet radio on Monday, October 5. Don't mind telling you that I was mildly terrified. Through a series of connections, involving the business.gov website, a woman named Barbara Weltman became aware of me and my connection with the NYS Small Business Development. Her producer, Gloria Luzier, e-mailed me and asked if I would appear on Barbara's radio show, Build Your Business Radio. I provided a few questions that she might ask me, about the SBDC, the State Data Center and blogs. I got a call about 4:20 pm to make sure I was actually at the appointed place, then again at 4:27. I never talked to Barbara herself before or after the show, but I was in contact with other friendly and helpful people, including Wade Taylor, wsRadio, Operations Officer and Assistant Program Director, who gave me information on how to provide the links below. Have I mentioned that I really HATE the sound of my own voice? I'm usually guilty of letting stressful situations get the better of me - quick temper, impatience with others, and other negative behavior. While there's nothing new in this article from last week's Forbes.com site, it serves as a useful reminder to me to heed its more direct suggestions: get exercise (it doesn't have to be marathon training), stay away from drive-thrus, etc. So, if you need a reminder as well, find the time & give it a read. Here is what they had to say about the SBDC. Small Business Development Centers (SBDC): Individual business counseling, Research Network Library, workshops, seminars and on-line classes for entrepreneurs who want to start a business, improve the performance of an existing business or learn about government procurement. Services are provided through a network of 24 regional centers and are free of charge or minimally priced. In today’s news, France announced plans to spend more than $2 billion (1.5 billion Euros) to create a battery-charging network for electric vehicles. In order to make owning and charging electric vehicles less onerous, the government would require charging stations in office parking lots by 2015 and in new apartment building complexes in 2012. This news reminded me of a very neat resource related to alternatively fueled vehicles in the U.S.. The National Renewable Energy Laboratory (a national lab of the U.S. Dept. of Energy) offers a online GIS tool, the TransAtlas, with data on alternative vehicles and fuels. The TransAtlas can map alternative fuel stations, the vehicle density of hybrid-electric, flex-fuel and diesel vehicles (down to the county level) and the location of hydrogen, biodiesel and ethanol production facilities. You can query the system (use the Query dropdown in the top right) to find information on specific points (ie stations) or select a region to download more details. 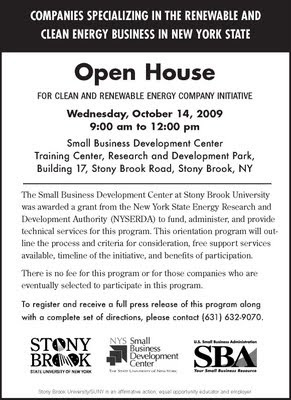 The Small Business Development Center at Stony Brook University has successfully competed in a New York State Energy Research and Development Authority (NYSERDA) Program Opportunity and was awarded $247,000 for its proposal entitled the “Stony Brook Energy Company Initiative”. The goal of the initiative is to facilitate the entry of new and existing companies into the renewable and clean energy business in New York State. The core of the Energy Company Initiative will be the traditional services offered by the New York State Small Business Development Center system. In addition, these basic services will be significantly augmented with a portfolio of activities including conferences, workshops, and counseling on funding opportunities specifically focused on renewable and clean energy business development. Further, an internet – based Early Stage Development Forum will be established to allow and encourage communication among energy company principals, and science, engineering and business experts during the company development process. The Stony Brook Energy Company Initiative will consist of two cycles approximately 22 months in length. The first cycle process will start with a Clean and Renewable Energy Company Workshop and Call for Papers (Energy Company Workshop) which is tentatively scheduled for mid-October 2009. The Energy Company Workshop, as well as subsequent workshops focused on energy, will be open to all New York State entrepreneurs interested in renewable and clean energy business development. At the initial workshop entrepreneurs will learn more about the fields of renewable and clean energy, will be shown how to connect with resources for support, and be counseled on the preparation of a white paper which will be due within 10 days following the Energy Company Workshop. The white papers will be reviewed by a committee consisting of Stony Brook University faculty and staff involved in the university’s economic development programs. The committee will identify a subset of those new and existing companies which will likely benefit most from joining the Energy Company Initiative. Individual Energy Business Development Teams (EBDTs) will be formed for each of the companies in the subset identified by the committee, consisting of the company principals, an SBDC counselor, a marketing and sales advisor and a technical advisor. Over the course of the following 12 months the designated EBDTs will be invited to participate in a series of additional workshops to help develop their respective companies and understand the nature of the business environment they are entering, will develop a full business plan, and will develop polished presentations to help them raise funds for their company. The business plans and presentations of the mature EBDTs will be used in a Financial Conference at the end of the cycle which will be attended by potential lenders and investors. Business plans and presentations will further be designed to meet the criteria for consideration by additional investor groups such as the Long Island Angel Network and, after the first cycle is over, be useful in applying for the $200,000 NYSERDA grants described in PON 1260. The Stony Brook SBDC has already started a blog for the initiatives, which you are invited to view and comment on. That blog is linked to this blog as well.